The Soothing After-Shave Moisturizer for Men from AHAVA has been expertly formulated with naturally mineral-rich Dead Sea Water, working to instantly calm and soothe skin after shaving. Enriched with calming Witch Hazel and Allantoin, it quickly absorbs and minimises the appearance of redness and razor burn. Extracts of Ginger and Ginseng add a revitalising burst, leaving skin refreshed and smooth. 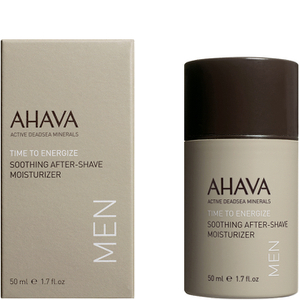 Apply to freshly shaven skin for instant absorption and relief of razor burn. Aqua (Mineral Spring Water), Hexyl Laurate, Behentrimonium Methosulfate & Cetearyl Alcohol, Propanediol (Corn Derived Glycol), Cyclomethicone, Aluminum Starch Octenylsuccinate, Alanine, Creatine, Glycerin, Glycine, Magnesium Aspartate, Saccharide Hydrolysate, Urea, Glyceryl Stearate, PEG-100 Stearate, Hamamelis Virginiana (Witch Hazel) Flower Water, Caprylyl Glycol, Chlorphenesin, Phenoxyethanol, Aloe Barbadensis Leaf Juice, Maris Sal (Dead Sea Water), Panthenol (Pro Vitamin B5), Parfum (Fragrance), Menthyl Lactate, Allantoin, Butylene Glycol, Centella Asiatica Extract, Calendula Officinalis Flower Extract & Propylene Glycol, Zingiber Officinale (Ginger) Root Extract, Ginkgo Biloba Leaf Extract, Panax Ginseng Root Extract, Bisabolol, Lactic Acid, BHA, Tocopherol (Vitamin E), Alpha Isomethyl Ionone, Benzyl Salicylate, Coumarin, Eugenol, Hydroxyisohexyl 3-Cyclohexene Carboxaldehyde, Limonene, Linalool.